Commissioners are studying the costs of cross guards at local middle schools after Driving Tampa Bay Forward reporting. 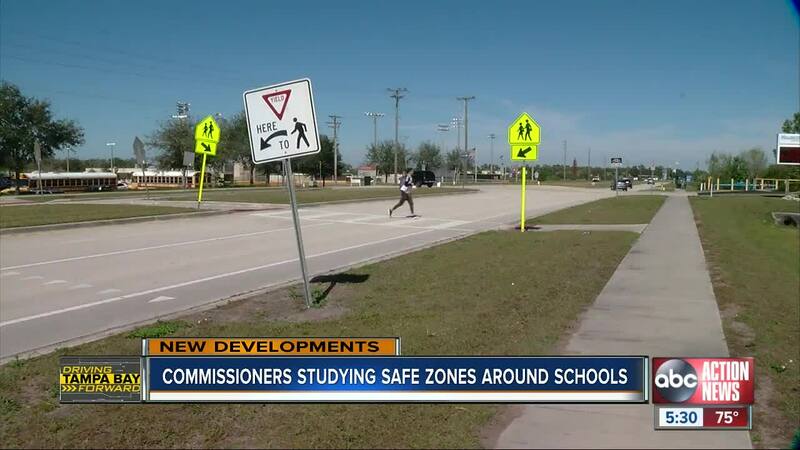 HILLSBOROUGH COUNTY, Fla. — A Hillsborough county commissioner is calling for a study into what schools need crosswalks, better signage and other safety enhancements within a two mile radius around them. During Wednesday's commission meeting, Commissioner Stacy White requested a feasibility study into what the cost would be to fund crossing guards at all middle schools. Another commissioner asked to take it a step further. Commissioner Pat Kemp asked for a study into what safety enhancements are needed within two miles of schools. · Staff recommendations for feasibility to create 2-mile safety zones around Hillsborough schools that would include crosswalks, flashing lights and all reasonable safety measures. Commissioner's voted unanimously to move forward with the study. Commissioner White's office said the commissioner wants a feasibility study to look at providing the crossing guards with the least amount of capital improvements needed as of now to get crossing guards implemented. Following that, the commissioner says he is open to what other safety enhancements are needed within the county. A spokesperson for the school district said they are working to set up a meeting with board of county commissioners to move forward in the discussion.